Wash the sabudana. Drain and keep aside for about 2 hours. If necessary, sprinkle a little water to moisten the sabudana. Divide the mixture into 12 equal portions. Shape each portion into a round and flatten slightly. 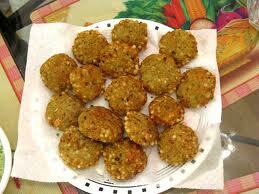 Deep-fry the vadas in hot oil until they are golden brown in colour and drain on absorbent paper.